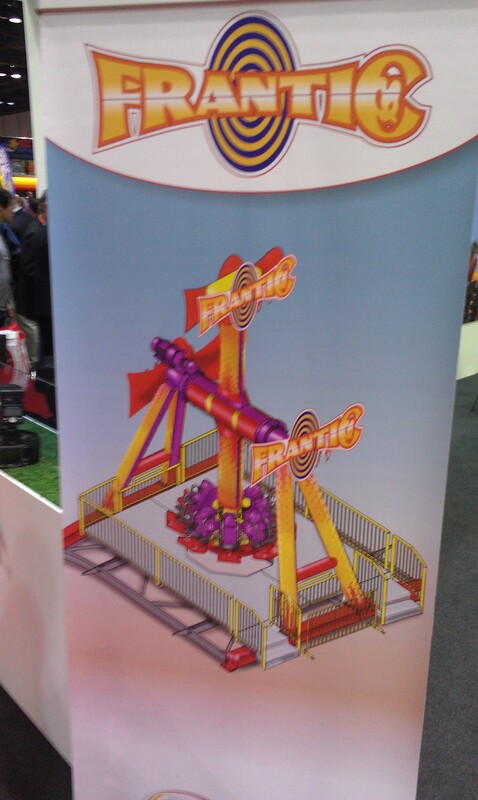 The last Six Flags announcement was over at Rocky Mountain Construction booth. 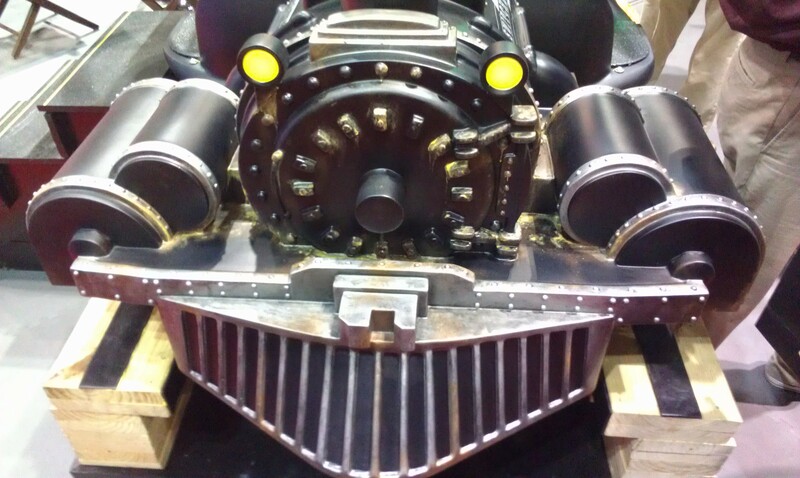 Bonnie Rabjohn, president of Six Flags Magic Mountain, introduced the lead car for one of the train for Twisted Colossus. This ride will feature 4 trains and the current plan is to run 3, with one kept as a back-up and when doing annual maintenance. 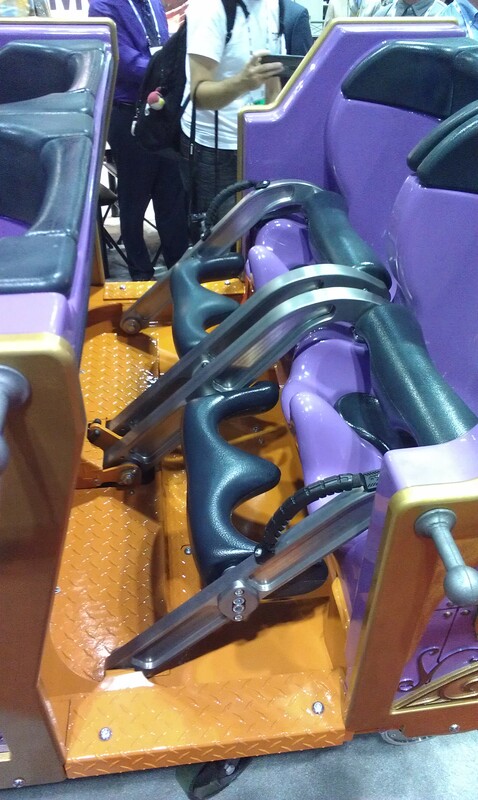 The redesigned shin bars and added seatbelts. Holiday World and Bolliger & Mabillard unveiled the lead car for Thunderbird. 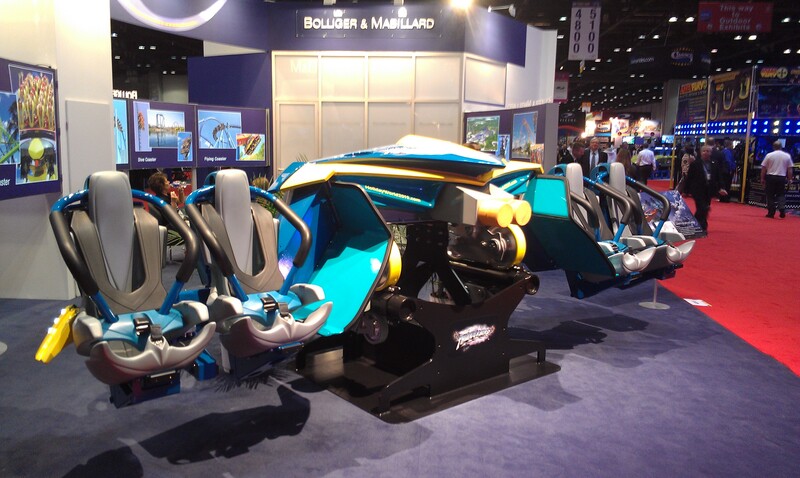 The world’s first launched Wing Rider roller coaster will debut in the spring of 2015. Koch family members and Mats Eckert, president of Holiday World in the seats. 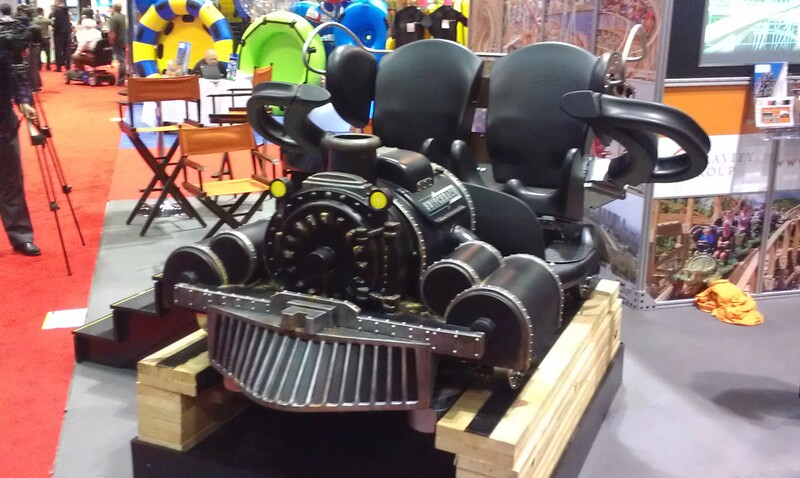 ZDT Amusement Park, located in Seguin, TX, introduced a brand new type of roller coaster at the show: the wooden shuttle coaster. 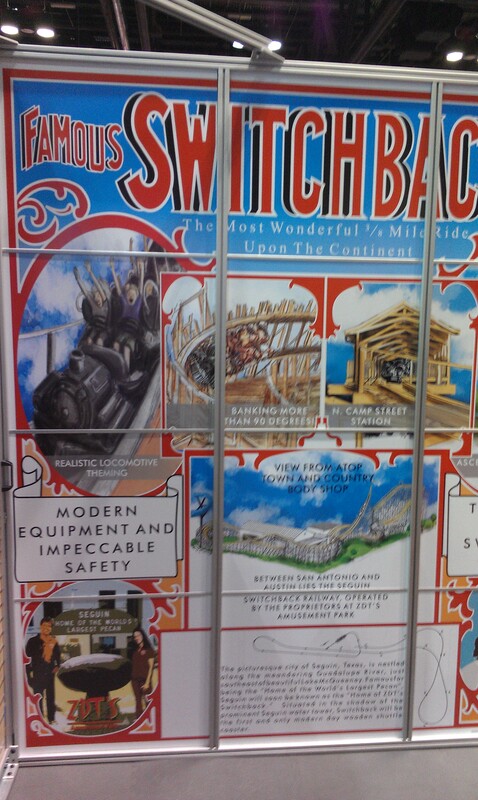 Designed and built by the Gravity Group, this new attraction will be called Switchback and the idea is to celebrate the introduction of the LaMarcus Thompson Switchback Railway in Coney Island. This will be the first modern shuttle wooden coaster and it also the most unique shuttle out there, featuring a standard lift and a transfer track partway throughout the ride. After climbing the 63.5 feet tall lift hill, the train will drop and navigate the 1175 feet long layout. But wait! At the end of the track and after whipping around a 104 degrees banked turn, the 8 passengers train will go up a titled 64.5 feet tall spike. Coming back around the layout, the train will get braked before the first drop and held there. The transfer track will move and allow the train to enter the station. 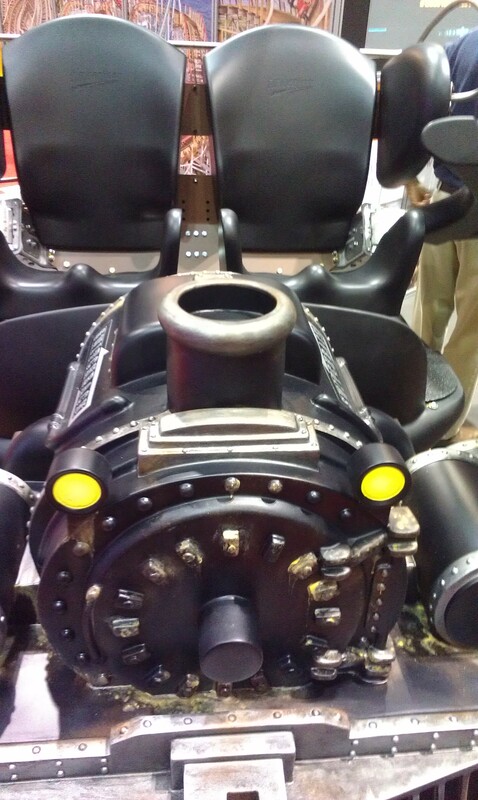 Also, it will be one of 4 shuttle coasters in the world to operate with two trains. 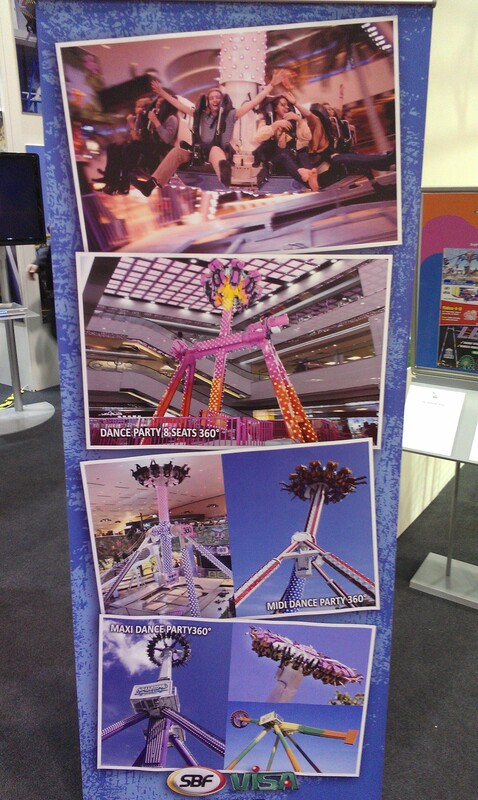 The total ride length will be 1980 feet and have 8 moments of airtime, 3 of which are backward. Closed Timberliner restraint with a water dummy. Part of the classic ad, that recalls the classic add of the late 1800’s. 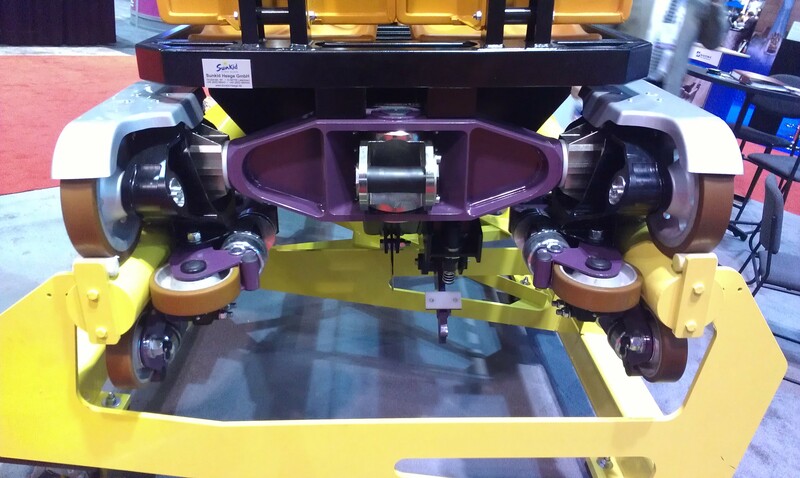 Maurer-Sohne introduced a brand restraint that will be used on the new X Coaster Evolution. 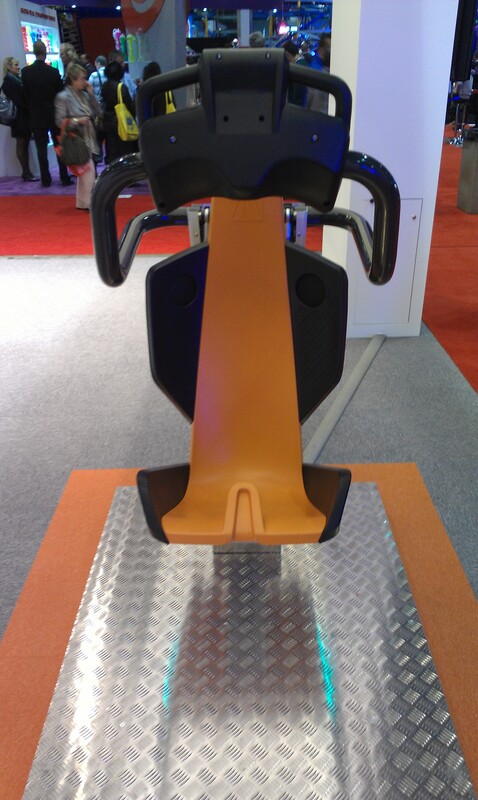 It features a comfortable overhead lap bar that is class V compliant and does not require an extra seatbelt. 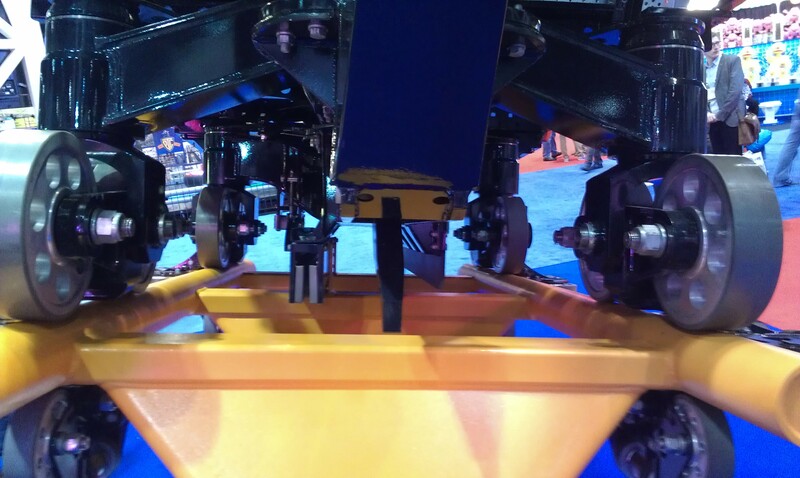 It will also be simpler from a maintenance point of view and it is indefinitely flexible. One to three cars can be used as a train, with 4 or 6 seats per car. Also introduced this year at the Asian Attraction Expo in Singapore was the new Saturn V concept. 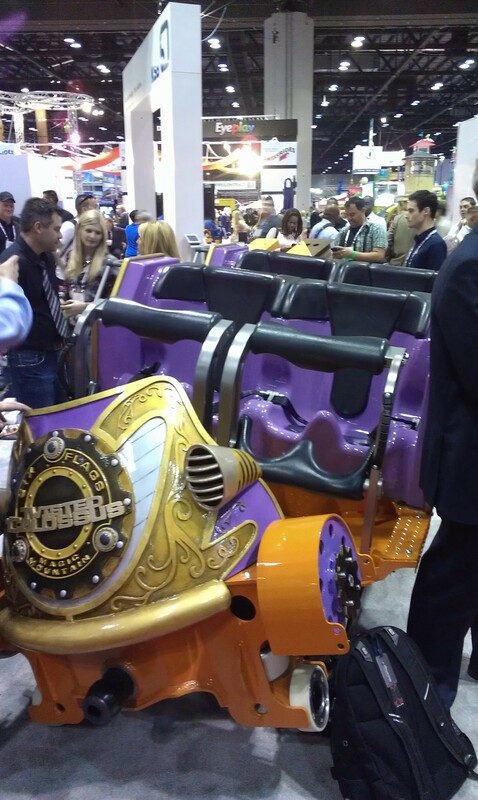 It is a roller coaster-dark ride hybrid that was created by Maurer-Sohne and Raven Sun Creative. 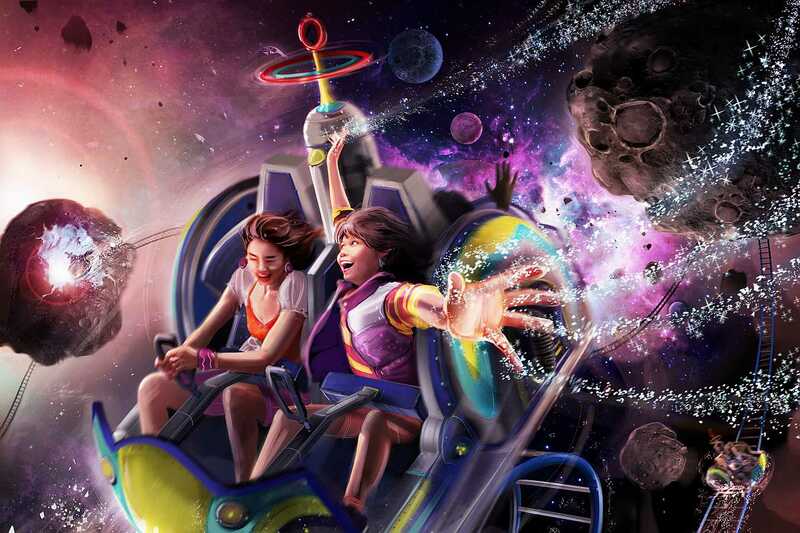 Using their experience in designing both Transformers: The Ride 3-D and Hollywood Rip Ride Rockit, the goal of both companies was to bring the same world class experience in an affordable package to regional parks. It is flexible and can be modified to fit particular budgets. 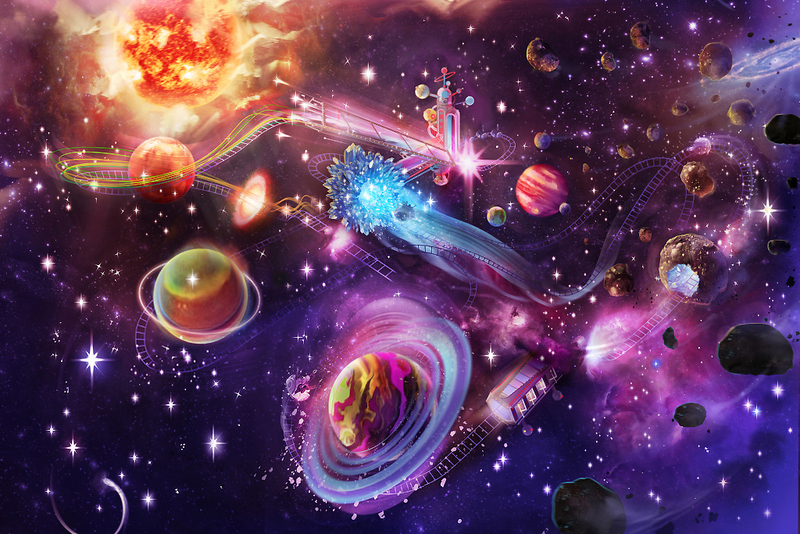 Physical sets, lighting, sound, physical sets and projections are used to simulate a trip to Saturn and back. Concept art of Saturn V.
Proposed layout of the attraction. 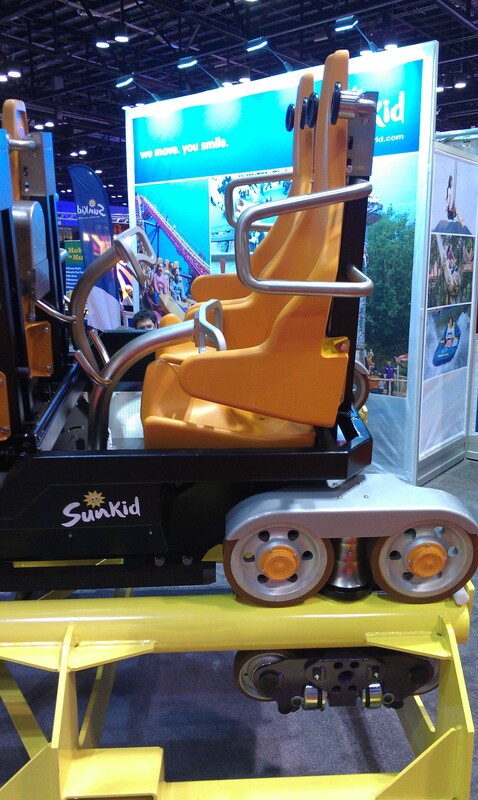 Sunkid-Heege was present at the show, showcasing the new Bigga Coaster and their replacement cars for the various looping coaster models. 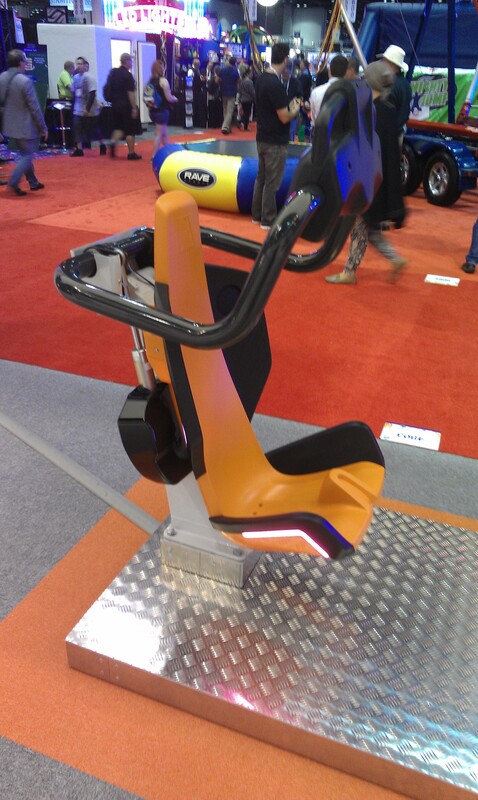 The Bigga Coaster is an unusual ride where riders stand on a car that resembles “Segway”. 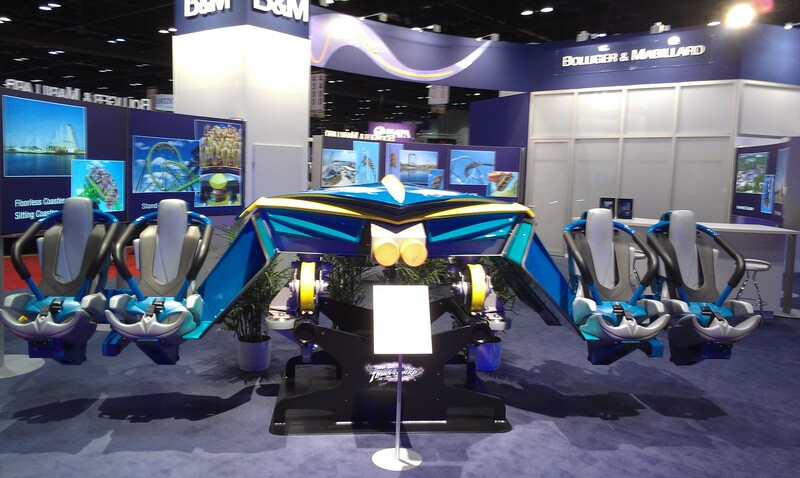 Then, they are powered around tight turns and small drops while standing up. 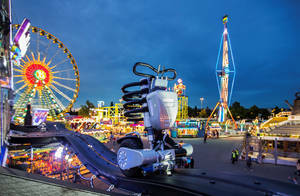 The first model opened this year as the Skydrive, which is installed on a 96 feet tall travelling attraction called the Event-Tower-Center. You can catch it at various large festivals around Austria and Germany. 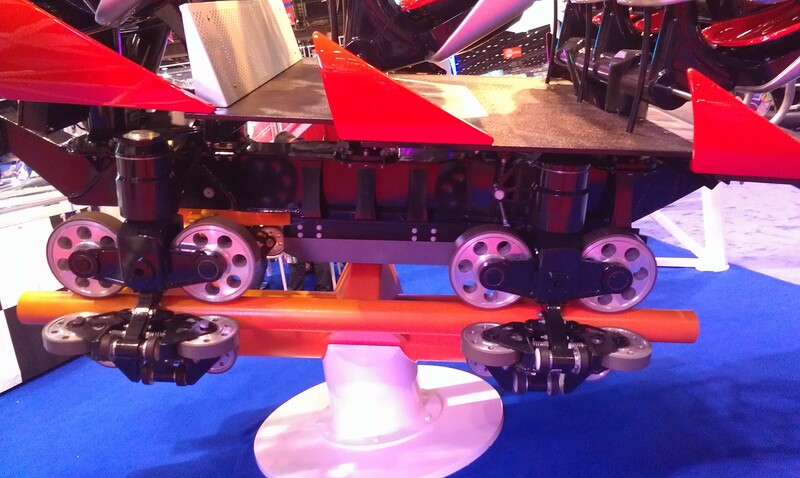 The replacement car is revolutionary, as it finally bring spring loaded guide and road wheels to Vekoma and Arrow 1200 millimeters gauge track. 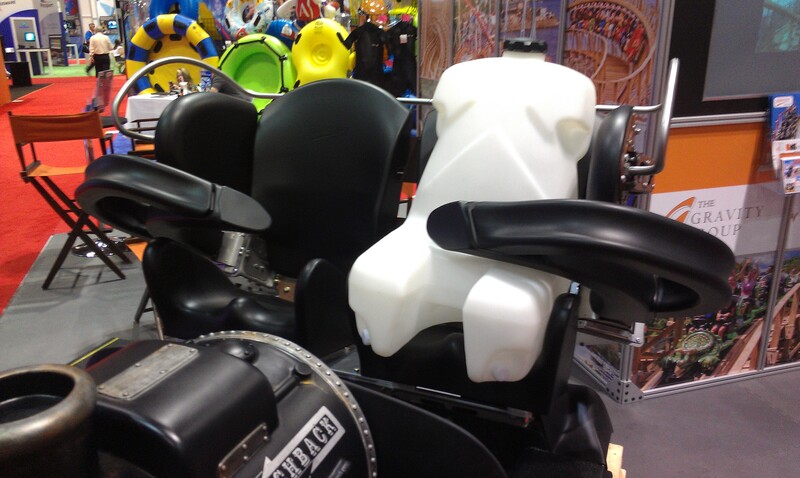 This meant that the roughness and violence usually associated with some rides is eliminated. 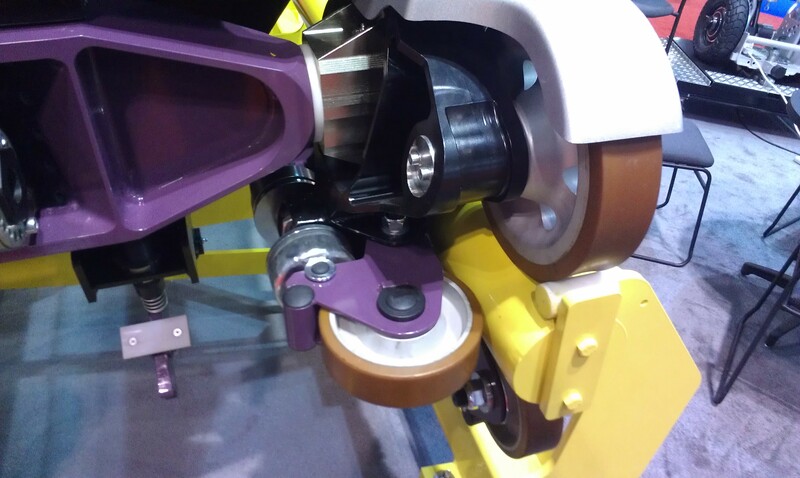 Also, the over the shoulder restraint are eliminated in favor of a steel T bar that secure riders by their upper legs, even when going upside down. It is very comfortable and uses a double ratchet locking mechanism. They are released pneumatically in the station. The car on display is a copy of the ones that were installed this year on Equalizer, the Vekoma Boomerang that operates at Walibi Rhone-Alpes (Les Avenieres, France). 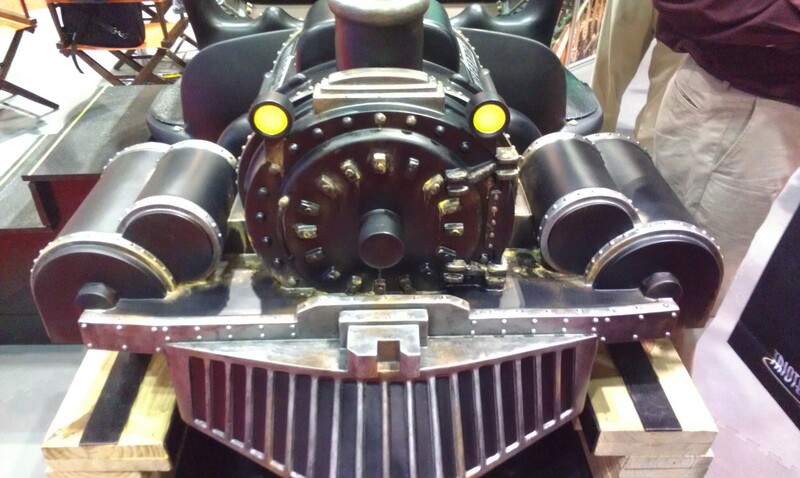 The Walibi installation called for onboard audio and this was installed on the train. 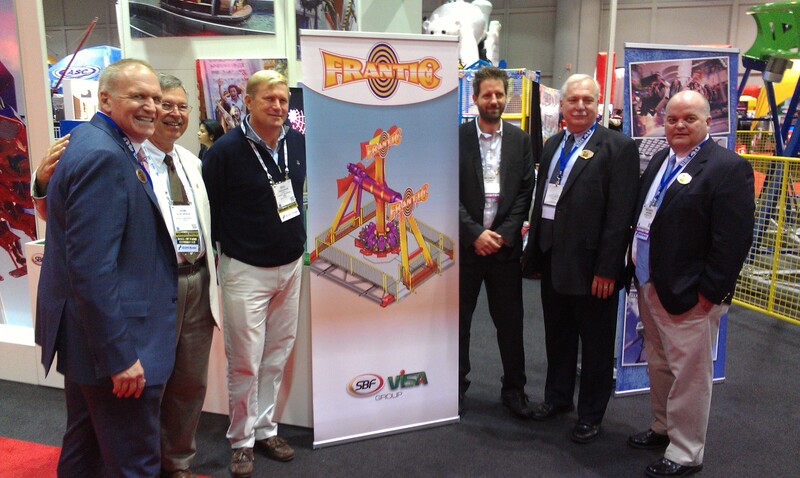 SBF Visa and Quassy Amusement Park (Middlebury, CT) introduced Frantic, a Twist N Spin 360 spinning ride. 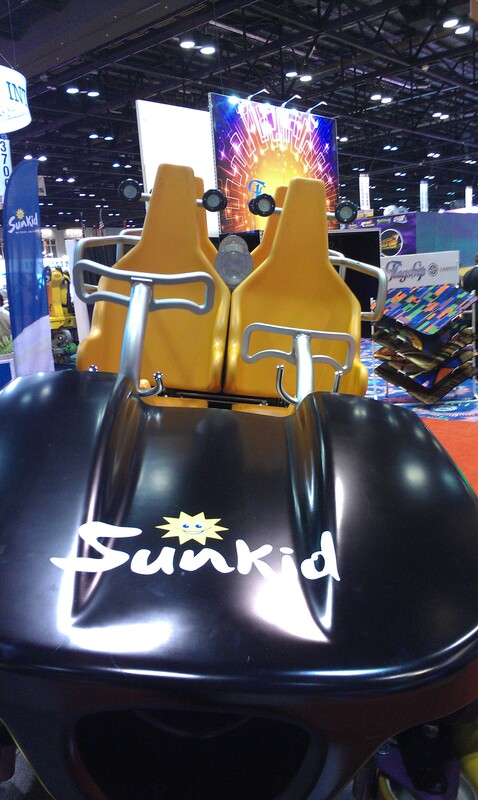 With a height limit of only 35 feet, the park has to carefully select its attractions and thus, they picked this ride, which will stand 34 feet tall once the car goes inverted. 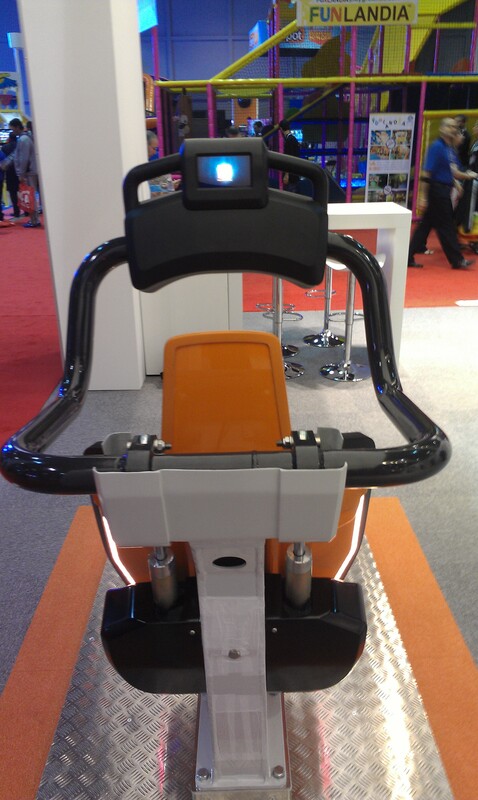 The car will be powered on the way up and then gravity will take care of the swinging, for added thrills and ease of maintenance. Various programs can be used, such as going up to 90 degrees, 180 degrees or going all the way around. The park plan to customize the program depending on the crowd each day, as the park is still a family park and some days, many children will visit. 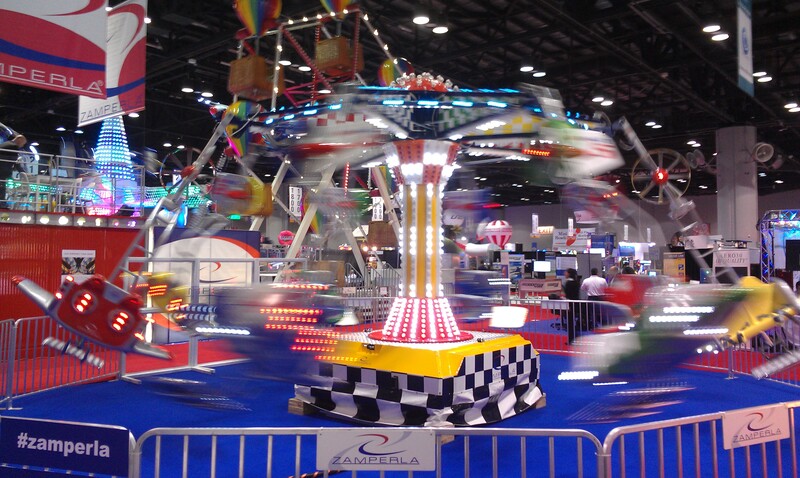 Zamperla had in addition to the Magic Bike 3 rides on display at their booth: an Air Race, portable Ferris wheel and Sky Race. 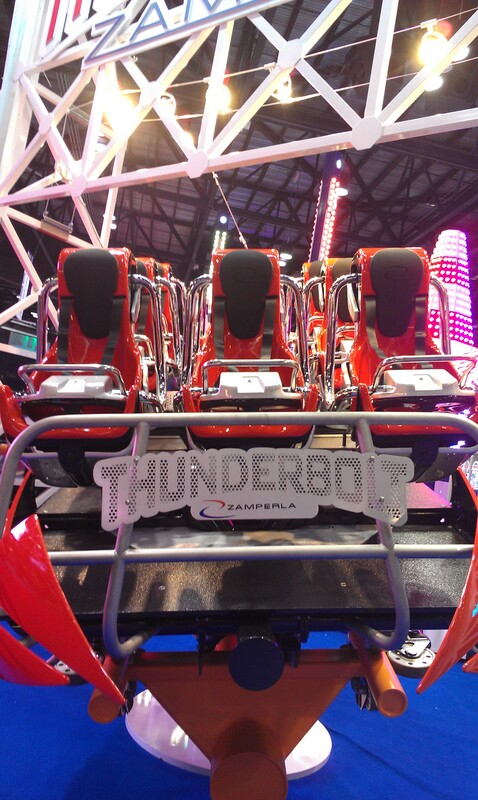 One of the car and a test seat from Luna Park (New York City, NY) Thunderbolt were also on display. 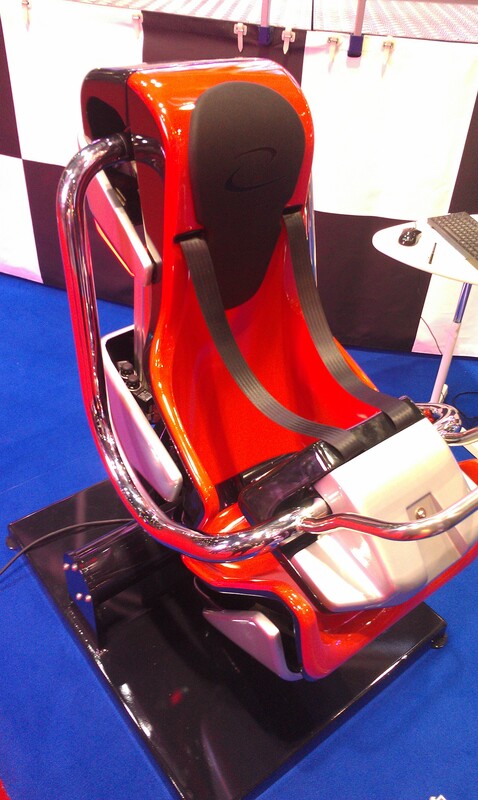 You could also virtually experience Thunderbolt while sitting in the test seat and putting on an Occulus Rift headset. 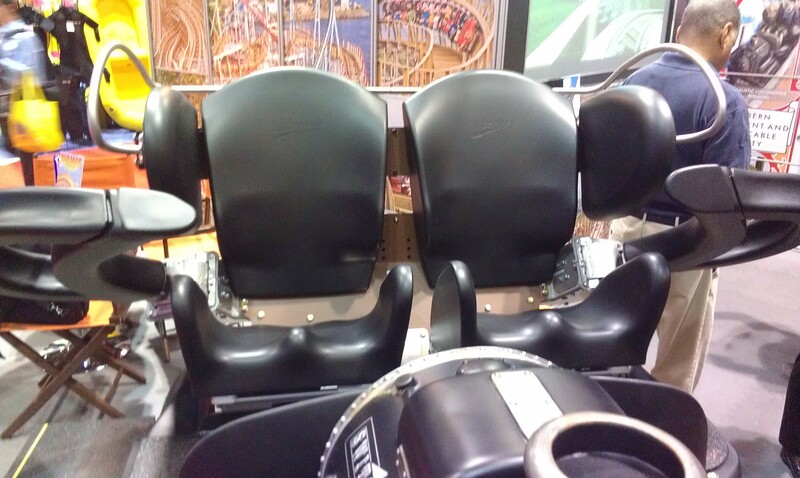 Thunderbolt test seat. The part that goes over the rider’s lap move for more comfort. Whitewater West showcased their new “Slideboarding” slide, where riders will go down face first on a rigid raft down a water slide. As they go down, various lights will go on and they need to press the right button on the raft in order to score points. At the end, they can see their scores on a leader board. On brand new installations, the whole slide is covered in LED screens. Whereas on existing slide retrofits, only the upper half will get the LED screens and that can cost 200 000 to 250 000$ depending on the slide. A new version of the Flowrider was introduced. The idea is to have an easily controlled wave where a lot of small nozzles can provide a custom wave that can be tailored to a beginner or experienced rider. The goal of Whitewater West is to promote it as a Destination Entertainment. It would be in its own building or area, would offer food and beverage and thus be a place where people can go spend a few hours. 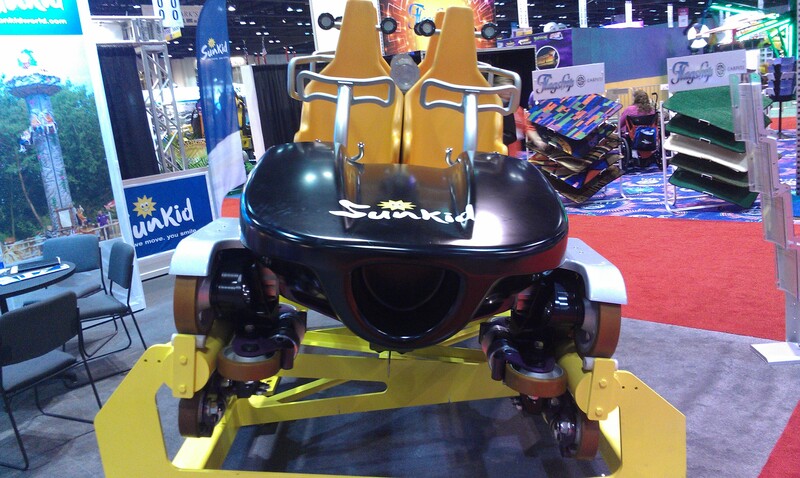 Avalanche Waterslides in collaboration with Sky Turtles Technologies introduced the Skycalibre looping water slide. At the top, riders will board a unique rigid raft that fully encloses them. 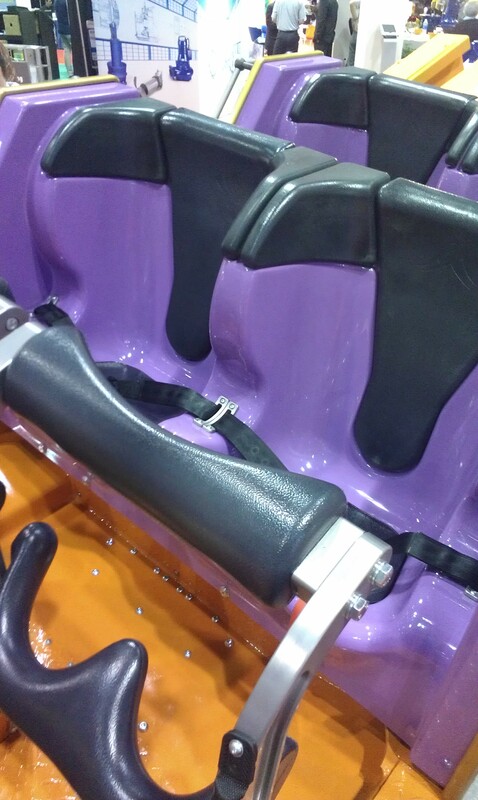 A roller coaster style shoulder restraint will secure them as they go down the vertical slide and around the loop. 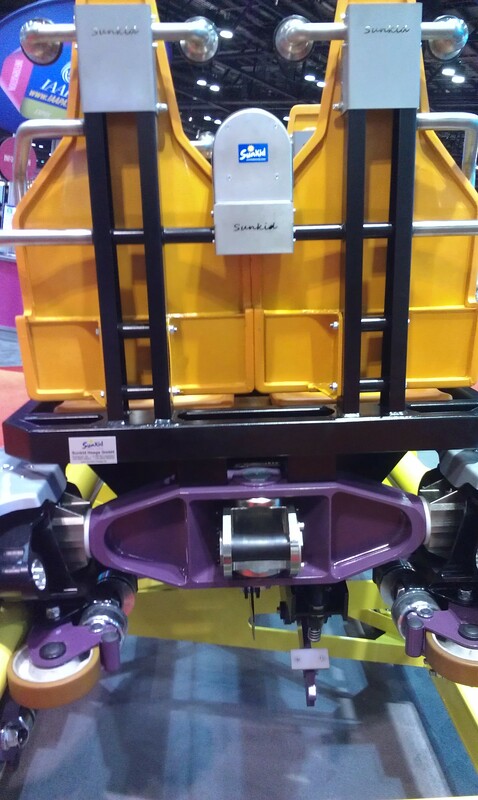 This entry was posted in IAAPA and tagged Bolliger & Mabillard, Equalizer, Gravity Group, Hersheypark, Holiday World, Laff Track, LaMarcus Thompson Switchback Railway, Maurer-Sohne, Quassy Amusement Park, Rocky Mountain Construction, roller coaster, shuttle coaster, six flags, Six Flags Magic Mountain, Sunkid, Switchback, Walibi, ZDT Amusement PArk. Bookmark the permalink. 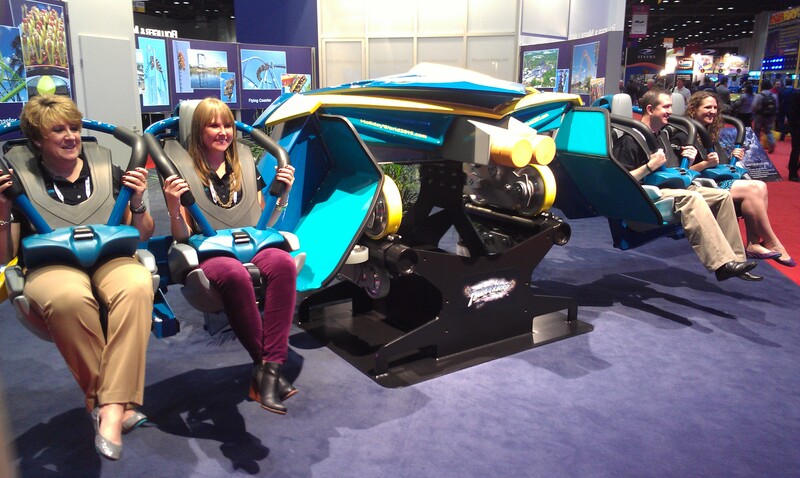 ← IAAPA 2014: part one of the recap of a record breaking Attraction Expo.